Navigate to the View/Edit Plan page by using the ‘Products’ link in the upper navigation bar, then clicking the name of the bundle which contains the plan you wish to view or edit, and finally clicking on the name of the plan you want in the list of plans attached to the bundle. Figure 43: The ‘Edit – Update Plan’ page. The Edit – Update Plan page (Figure 43) displays the overall settings for the bundle you chose to look at, and also a list of the plans which this bundle contains. Here you can edit these settings to change the nature of the bundle in some ways, and you can also configure how the plans are presented to users. 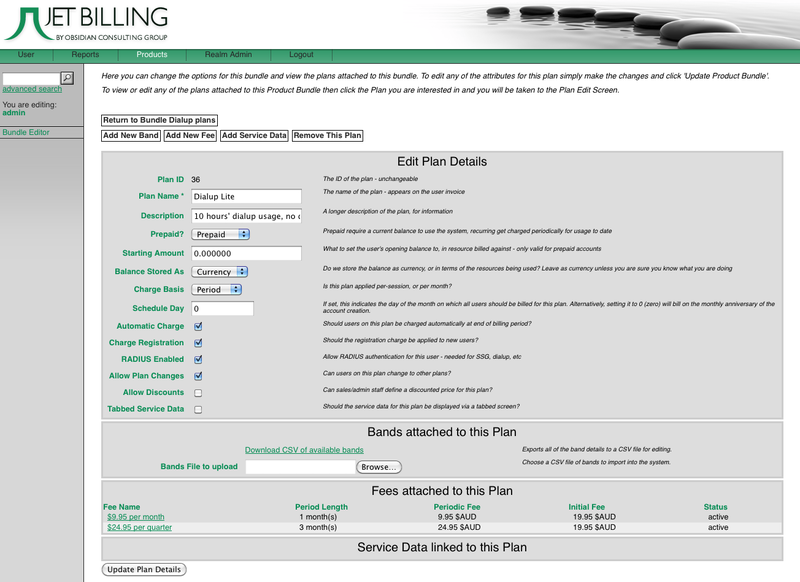 Allows you to edit the attributes of existing plans. You can edit most of the configurable settings described below from here. However note that some settings cannot be changed after the initial creation of the plan (such as the planid) These attributes are displayed in a ‘locked’ format, where the text appears but is not editable. The planid is used by the Jet database to keep track of information for auditing and historical billing purposes, and thus cannot be changed after creation. There is nothing you can do to change this or to change how it is displayed. 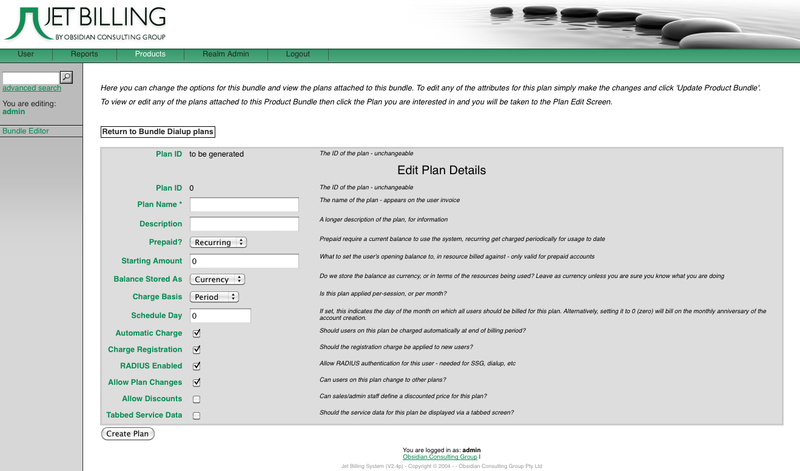 Although there is an option to delete the current plan from the product bundle, this doesn’t actually delete the plan from the system, it merely removes the association of this plan from this product bundle. This is so that users that have already signed up for it will remain on this plan even after it is removed or deleted from this product bundle. It may be better to think of this action as disassociating the current plan from the product bundle, especially if you consider that once a plan is no longer part of a bundle, no new users can be signed up to it. However, existing users who are still signed up to it will be billed as usual, until they are migrated to a new plan. In spite of this, it is also true that detaching a plan from a bundle this way will permanently detach it from that bundle. If you decided you needed to attach the plan to the bundle again, you would actually need to create another plan with identical settings from scratch. Figure 44: The Create Plan screen.